I’m Paul and I’m married to Heather who was diagnosed with Rheumatoid Arthritis (RA) in March 2009. We were married in 2008 and our lives appeared to be full of hopes and dreams as we planned our married life together. Heather was working full time and was fit and healthy. Heather became ill in the autumn of 2008 with excruciating shoulder pain and constant fatigue. Some days she could barely move, I had to watch helplessly as she struggled to get comfortable in bed, barely able to sleep. It was so hard to watch the woman I love go from being such a fit and healthy person to someone who could barely move sometimes. I asked myself why, what had changed? In 2009 Heather was finally referred to a Rheumatologist. She was given a diagnosis of RA. Heather tried a number of different treatments whilst I stood by helplessly as she suffered the side effects of the different drugs, as well as the disease itself. I have watched her RA attack her body, plans have had to be set aside because the disease is so unpredictable, it’s so hard to see her suffer. 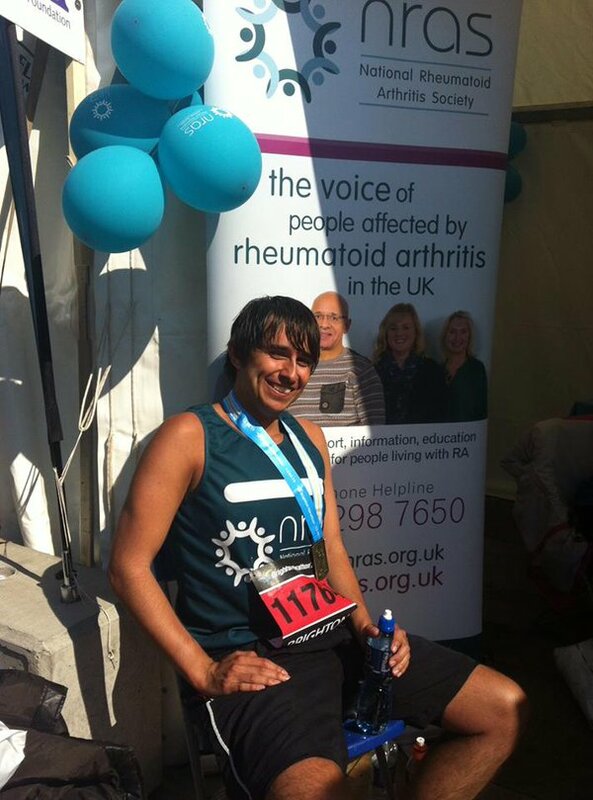 NRAS has been a tremendous help to both of us so I decided I wanted to fundraise for them and chose the Great North Run – half marathon, which I have completed twice. Also I completed the Yorkshire Three Peaks Challenge walk – 25.2 miles in one day. My pain after these events is only temporary and disappears after rest. For people living with RA it is a daily event. If I can raise funds to assist in keeping the helpline available for people then this helps me to cope. In order to raise funds I have used Just Giving, Virgin Giving, church notice sheets, e-mail to all staff in the office where I work. I have also contacted the immediate houses where I live putting flyers through doors to advertise that I was raising funds for NRAS. I thought it was important that people were aware of why I was fundraising for example, the much needed work that NRAS provides to members and that they appreciated it was for a small charity thus their donations would have immediate effect. It was wonderful on both the runs and the hill walk to be motivated that completing these events and collecting the sponsorship money would provide much needed funds for NRAS. If my sponsorship money could keep the NRAS helpline in operation for just one day and therefore provide guidance to all the callers then I had succeeded for us and NRAS. Although I was already an accomplished hill walker of 30 years experience the Yorkshire Three Peaks Challenge completed in 11 hours was one of the hardest walks/climbs I have completed. It certainly tested me mentally and physically. However, my running experience was fairly limited and therefore I started off small running on local roads with longer runs at the weekends. I found keeping a record of my distances and times motivated me to try and run longer in order to build up to a half marathon. I also found a local golf complex which had a perimeter road which was quite hilly. This provided a suitable alternative to local flat roads. Entering the Great North Run twice on behalf of NRAS was a privilege and on the days running with 35,000 other runners inspired me when my legs wanted to give up. Both the event that you have entered and your chosen charity should be able to provide you with practical ideas and support on how to fundraise. Be aware that once you have entered one event it becomes addictive and you just want to do it all again. After all I only endure the pain for days whereas people suffering from Rheumatoid Arthritis endure pain every day of the year. Start small and just keep going. A journey of a thousand steps begins with one small step and even the longest and most difficult ventures have a starting point.